That's right, y'all. All it took was an old box of Unifix cubes destined for Goodwill to save my classroom. It was a couple of weeks before Spring Break, and I was desperate to find something that would get us to that much needed two-week break without losing it. It's not that things were out of control. But-there was just enough shenanigan-making to drive me nuts. It wasn't everyone, but it was enough that it was disrupting the entire classroom. I really wanted to acknowledge the kids who were consistently on-task and following our rules, but I needed it to be quick and discreet. 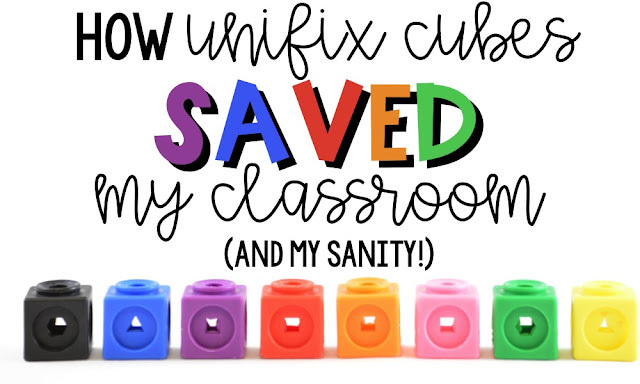 And that was when I saw it-an old box of Unifix cubes in the Goodwill donation pile on my dining room table, and the idea hit me like a ton of, well...Unifix cubes. Each kiddo starts the day with three cubes. It's basically like three chances. They can lose them for a variety of reasons, and they can earn extra ones for a variety of reasons. At the end of every day, we counted up our cubes, and I wrote the totals in the grade book. After a certain amount of time, I would select a (not so random) number, and anyone who had accumulated that many cubes earned an incentive. The kids can lose cubes for any reason. To be honest, I use it mostly as a behavior deterrent in that I notice the behavior, I move closer to the student (proximity), and I make eye contact, giving the student a chance to knock it off ALL WHILE I'M STILL TEACHING. If the behavior continues, I simply remove a cube from their stick and keep walking. No discussion, no stopping the lesson...nothing. The fact that they lost a cube tells them they were doing something that was not okay. Now-do discussions happen later? Sometimes, if I notice the student getting all grumpy or sad. But it's a quick conversation that reminds them of the chance I gave them and why I took a cube. I also remind them of the multiple opportunities they have to earn more. But for the most part, the student changes their behavior, and it's done. What if they talk back or argue when I take a cube from their desk? Well, my kids knew I would swipe another one, so it was best not to talk back or question me while I am teaching. However, if they felt they were treated unfairly, I did hear them out at an appropriate time. Usually it didn't help their cause, but sometimes it did. I also wanted them to know that I was willing to listen to them. What if they ran out of cubes? This happened on occasion. In our school, students walk laps at recess as a consequence for behavior. They call them "thinking laps." If they went into the hole on their cubes, it was a lap for each time I had to correct behavior. Done. What about serious behavior issues? Obviously the cubes didn't apply for serious behavior problems. Hitting, swearing, throwing things...those are offenses that are referred straight to the office. The kids knew that any behavior that earned them an office referral would also cause them to forfeit all their cubes for that day. Students can earn cubes for ALL SORTS OF THINGS. Being kind, helping a friend, picking up trash they see in the hallway, working quietly, bringing back a school form...the list goes on and on. They also earn cubes for answering questions...even if they're wrong. It's about effort and focus and trying and participating. My participation level for group discussions go through the roof when I have a handful of cubes with me. The thing to remember is that sometimes I do give cubes, and other times I don't. The kids know not to ask for them. I just trained them that way when we started the whole thing. This is the easy and CHEAP part. Usually the incentives revolved around something that didn't cost me a penny and required no work from me. Bring a stuffed animal to school, no shoes for the day, sit by a friend, pillow day, pajama day, crazy hair...you get the idea. When I felt super motivated, we would have doughnuts or cookies and milk or something like that. But here was the important part-I was very purposeful in the "number" of cubes the kids had to have in order to earn the incentive. Sometimes, one of my toughest kids would only have 5 cubes total after a few days. Well, guess what the lucky number was...5! I didn't do that all the time, but I did want to get as many kids involved in the incentives as possible, and I wanted to reward effort when I saw it. Other times, the number would be 25. It really just varied as I saw fit. And that's what is so great about this! You make it fit your needs. I'm serious, y'all. This system worked so well that I am starting it at the beginning of this upcoming school year, and I have high hopes for it. I don't have to worry about stickers, or punch cards, or clip charts. It's such a weight off my shoulders to know that these little cubes can do so much to improve the classroom environment and requires little work from me. Please let me know if you have any additional questions about how I made this system work for me. As with all behavior management plans, what works for one classroom might not work for another. And...just like what works for one class one year might not work with the next class the following year. But...it's definitely worth a try!